Beef Barbacoa tacos with smoked brisket, pickled red onion, cotija and avocado crema from Lone Star Taco Bar on Cambridge Street. It’s not easy to find decent Mexican food in Boston, but if you’re determined to find it you’ll need to look farther than Anna’s Taqueria. I’m sorry, Anna’s. I don’t care how many people rave about you on Yelp: When you slap a whole square slice of cheddar cheese on my burrito, it’s hard for me to believe that you have any understanding of what authentic Mexican cuisine actually looks or tastes like. As far as I’m concerned, you’re just a locally owned version of the fast food chain Chipotle, and I am beyond unimpressed. Fortunately, the real-deal taco experience does exist in Boston at a place that doesn’t mix avocados with mayonnaise and call it guacamole. Lone Star Taco Bar in Allston, located at 479 Cambridge St., has been doing Mexican food right since 2012. With nothing but a modest silver star out front marking the building, Lone Star can be hard to find if you aren’t paying attention. But make sure you do, because this place is too good to miss. Like the stark exterior of the building, the inside of the small, dimly lit restaurant is modestly decorated — perhaps because the food has too much personality to be distracted by décor. Save for a large stuffed bison head and a large tarnished mirror, nothing hangs on the dark gray walls. One wall of the narrow restaurant is lined with stainless steel tables and at the other, a full bar. On a Wednesday night, all 35 seats in the house are filled. The small crowd of people that is willing to wait 30 minutes, lined up outside in 20-degree weather, for a table or a spot at the bar to open up is enough to convince me that I’ve chosen the right spot for dinner. The bartenders and servers are friendly and attentive, despite the chaos of the crowds and the punk rock blasting through the overhead speakers. After finally snagging a seat at the crowded bar, I am immediately handed a drink menu with a polite smile and a helpful drink recommendation. Since I had never been there before, the bartender suggested that I order a Michelada, one of the restaurant’s most popular drinks. He explained the drink as beer mixed with spicy bloody mary mix over ice, served in a glass with a salted rim and a lime wedge garnish. He had me at “spicy beer.” At only six bucks a pop, the combination of spicy tomato, bubbly beer, sour lime and crunchy salt is refreshing, piquant, unexpected and unbeatable. Had it not been a school night, I would have, without a doubt, ordered more than one. It’s almost impossible to justify a Mexican meal without chips and salsa and so, after receiving my drink, I couldn’t resist placing an order. How can one mess up chips and salsa, you wonder? Too often have I been to a Mexican restaurant that served me a stale basket of chips that tasted like they came straight from a Tostitos bag and jarred salsa that coated my mouth with flavors of processed tomatoes and artificiality. But not at Lone Star. Just minutes after placing an order, an enormous plate of hot, crispy, lightly salted tortilla chips straight from the fryer and a heaping bowl of smoky, house made, fire-roasted tomato salsa were delivered to our small corner of the bar. The plate — which had enough chips and salsa to satisfy a family of four — cost only $3, and I devoured the whole thing myself, save for the seven or eight chips I allowed my roommate to eat. But we had come for the famed tacos, and no stomach full of chips and beer was going to stop me from enjoying them. Each taco is served a la carte. At only $4 each, customers have the option to mix and match in order to create the ideal individualized and affordable taco plate. Although the beer battered fresh white fish taco with pickled cabbage slaw and chili mango aioli was my seafood friend roommate’s favorite, I preferred the house made chorizo taco. The combination of spicy ground pork sausage atop a soft homemade corn tortilla topped with mild and creamy “queso fresco” and crunchy, tangy pickled radish causes an explosion of bold and fiery fiesta flavor into every corner of your mouth like authentic Mexican should. 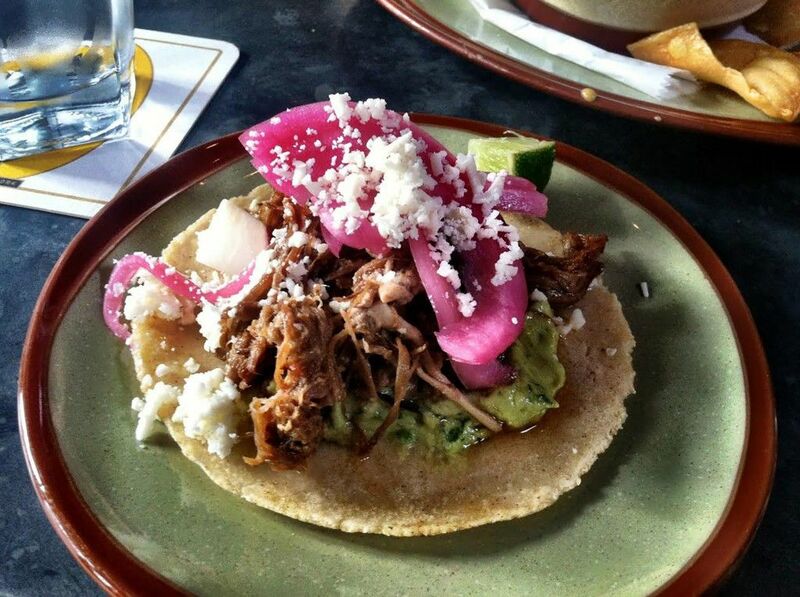 For those that prefer a more mild bite that won’t donkey kick the taste buds with heat and spice, the tender carnitas pork taco, ladled with sweet salsa verde, fresh cilantro and mild queso fresco on a fresh corn tortilla is one that is jam-packed full of flavor – even without the spice. Lone Star’s tacos are simply finger-licking good. Even after the last bites of our tacos, my roommate and I pulled out our forks to scrape up all the little pieces of meat and fillings that had fallen out of our tortillas between huge sloppy bites. Not even the slices of raw radish were left on the plate, as we topped them with hot sauce and lime before devouring them, too. When places as delicious, authentic and affordable as Lone Star Taco Bar exist, it’s hard to believe that people are still eating at places like Anna’s Taqueria to satisfy their Mexican food cravings. Why settle for mediocre when, for the same price, you could have the best?